Brussels, capital of Europe: a sustainable choice? Bruxelles capitale de l’Europe : un choix écologiquement défendable ? Brussel hoofdstad van Europa: een ecologisch verantwoorde keuze? There are many criteria which determine whether a city is a good capital. Ecological considerations lead us to place more emphasis on one criterion in particular, i.e. the more or less central location of the capital within the territory. Which European city meets this criterion best? Is the choice of Brussels as capital of the European Union likely to withstand the growing importance of this criterion and the continued enlargement towards the east? 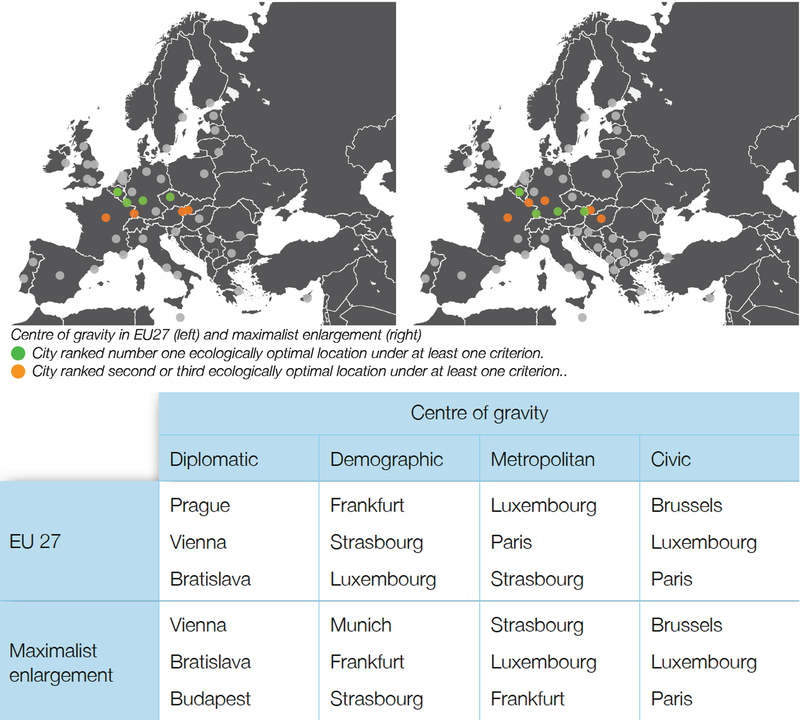 In order to answer these questions, this article defines four centres of gravity – “diplomatic”, “demographic”, “metropolitan” and “civic” – using new databases and computation techniques. 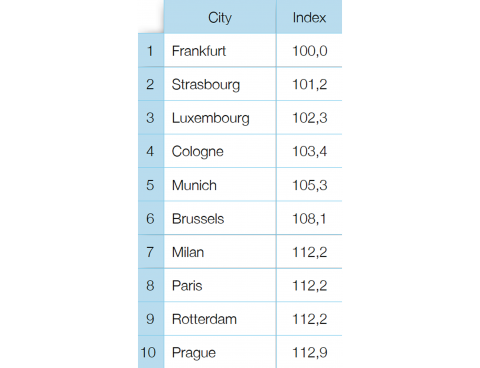 Within the framework of the EU-27, Prague comes first from a “diplomatic” point of view, Frankfurt from a “demographic” point of view, Luxembourg from a “metropolitan” point of view and Brussels from a “civic” point of view. In a maximalist scenario of enlargement towards the east, this group is replaced by Vienna, Munich, Strasbourg and Brussels. The fourth criterion – which is the most favourable to Brussels – is also, on the surface, the most unstable. This article ends with a discussion of the mechanisms which are likely to ensure that Brussels will keep the “civic centrality” imparted to it historically by chance. Ce qui fait d’une ville une bonne capitale dépend de multiples critères. La prise de conscience écologique conduit à accorder plus d’importance à l’un d’entre eux : la localisation plus ou moins centrale au sein du territoire. Quelle ville européenne répond le mieux à ce critère ? Le choix de Bruxelles comme capitale de l’Union européenne est-il susceptible de résister à la croissance de son importance ? Et à la poursuite de l’élargissement vers l’Est ? Pour répondre à ces questions, cet essai définit quatre centres de gravité – « diplomatique », « démographique », « métropolitain » et « citoyen » – et mobilise des bases de données et techniques de calcul nouvellement disponibles. Dans le cadre de l’Europe des 27, Prague arrive en tête du point de vue « diplomatique », Francfort du point de vue « démographique », Luxembourg du point de vue « métropolitain » et Bruxelles du point de vue « citoyen ». 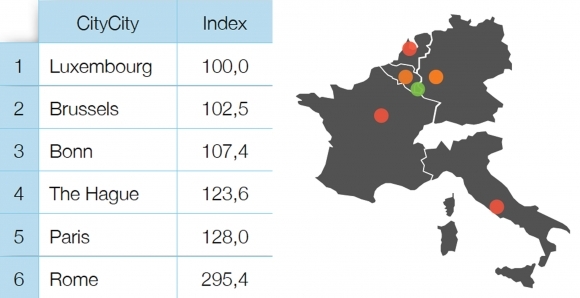 Dans un scénario maximaliste d’élargissement vers l’Est, ce quatuor est remplacé par Vienne, Munich, Strasbourg et Bruxelles. Le quatrième critère, le plus favorable à Bruxelles, est aussi, à première vue, le plus instable. L’essai se termine par une réflexion sur les mécanismes susceptibles d’assurer que Bruxelles garde la « centralité citoyenne » que les hasards de l’histoire lui ont conféré. Wat van een stad een goede hoofdstad maakt, hangt af van een veelheid van factoren. Ten gevolge van de ecologische bewustwording hecht men meer belang aan één bepaalde factor: de min of meer centrale ligging op het grondgebied. 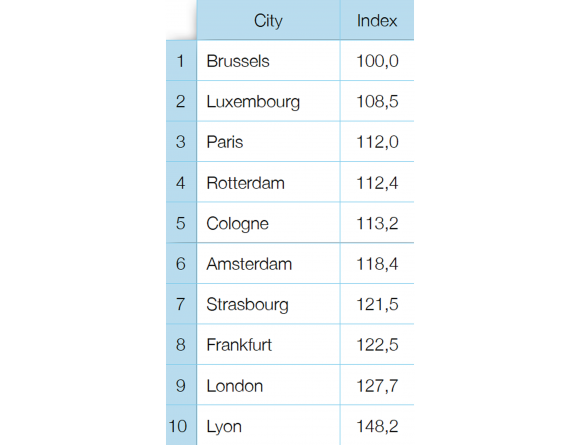 Welke Europese stad beantwoordt het best aan dat criterium? Is de keuze van Brussel als hoofdstad van de Europese Unie opgewassen tegen het toenemende belang van dat criterium en tegen de voortzetting van de uitbreiding naar het oosten? Om die vragen te beantwoorden, worden in dit essai vier zwaartepunten gedefinieerd: het diplomatiek zwaartepunt, het demografisch zwaartepunt, het grootstedelijk zwaartepunt en het maatschappelijk zwaartepunt. Daarbij wordt gebruikgemaakt van gegevensbanken en berekeningsmethoden die kort geleden beschikbaar werden. In het Europa van de 27 bekleedt Praag de eerste plaats als “diplomatiek zwaartepunt”, Frankfurt als “demografisch zwaartepunt”, Luxemburg als “grootstedelijk zwaartepunt” en Brussel als “maatschappelijk zwaartepunt”. In het scenario van een maximale uitbreiding naar het oosten, wordt dat viertal respectievelijk vervangen door Wenen, München, Straatsburg en Brussel.Het vierde criterium, dat het gunstigst is voor Brussel, is tevens op het eerste gezicht het minst stabiel. Het essai wordt afgesloten met een reflectie over de mechanismen die ervoor zorgen dat Brussel, dat mettertijd naar het “zwaartepunt van de maatschappelijke betrokkenheid” is geëvolueerd, die status behoudt. This text develops the fourth and last part of “Un sustainable new deal pour la Belgique”, presented by Philippe Van Parijs at the annual forum of the Federal Council for Sustainable Development, Brussels, 16 November 2009 (www.belspo.be/frdocfdd/DOC/fora/SND_2009/van_parijs_tekst.pdf). 1Which European city can aspire to the title of ideal capital of the European Union? The answer to this question depends inevitably on the importance given to several criteria. For many, for example, the verdict depends on the importance of the member state in which the city is located, its previous status as capital city, the strength of its membership to the Union, the languages spoken there, the distance to the border between Germanic Europe and Latin Europe or between western Europe and central Europe, or the symbolic interpretation which may be made if it were chosen. All of these criteria probably have varying degrees of importance to most people. But there is one which is certainly important to everyone: location. As ecological considerations take on greater importance and are expressed in an increase in the cost of travel, this criterion will be given increasing weight. 3 Annexe 1 specifies the computation method, and annexe 2, the sources of the data used. 4On a backdrop of answers thus provided to the various interpretations of our main question, we shall focus on a question which arises more and more often and is becoming more pertinent. Considering the past and future enlargement of the European Union towards the east as well as the growing importance of ecological considerations, is the position of Brussels as capital of the European Union on the way to becoming more and more uncertain? 5Throughout the analysis, we shall assume that travel costs and/or the development of virtual methods of communication will not reduce the need for a capital city. We shall assume that there will always be a growing need for a small number of places – and preferably just one place (precisely in order to minimise travel) – where we can communicate, negotiate, collaborate and take action beyond the borders of European nations, and for this to happen side by side, face to face and arm in arm, and not only by blogging, twittering and skyping. The growing importance of ecological considerations will not eliminate the need for a hub city for intense transnational activity. It will not even condemn the idea of a “polycentric capital” which contrasts with the centralising model of nation-state capitals, at least when a certain distance is deemed to be beneficial in order to preserve the autonomy of institutions such as the European Court of Justice, the European Central Bank or certain agencies.5 But it will certainly force us to question without taboos the optimal location of this indispensable capital. 6Our first simulation consists in determining the “diplomatic centre of gravity” of the European Union, i.e. in which of the member state capitals would it be preferable to meet, assuming that the only pertinent consideration is the minimisation of the number of kilometres covered and that each time only one person has to come from each capital. 7Let us first consider the original European Communities, i.e. the EU-6 (Table 1). Of the six capitals at that time, which one minimised the total distance with respect to the others? The answer is Luxembourg, which has a slight edge on Brussels (+2.5%) and more so on Bonn (+7.4%). The capital of Luxembourg was therefore the optimal choice from this point of view, when it was chosen as the ECSC headquarters in 1952.6 Six years later, the two new commissions (EEC and Euratom) were established in Brussels, where a Single Commission was created in 1967. This move became judicious in 1974 in terms of the minimisation of distances, with the accession of the United Kingdom, Ireland and Denmark. 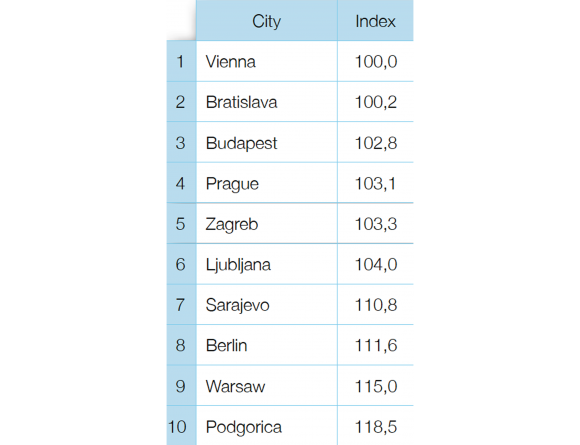 The city with the smallest sum of distances to all of the other cities has an index of 100. This also applies to all of the following tables. The distances between cities are the great circle distances calculated according to their geographic coordinates. Source of the coordinates: Wolfram|Alpha (2010). 9Let us move on to a third variant of this first simulation. What is the “diplomatic centre of gravity” in the maximalist scenario of enlargement towards the east, including all of ex-Yugoslavia (Croatia, Montenegro, Macedonia, Serbia, Bosnia-Herzegovina, Kosovo), Albania, Moldavia and Turkey (Table 3)? It is not because it would be more likely than others that this scenario has been chosen: we could, for example, consider the full accession of Turkey or Moldavia as unlikely, or as less likely than that of Iceland, Norway or Switzerland. The heuristic advantage of the chosen scenario is that it corresponds to a maximalist hypothesis of a shifting of the centre of gravity, and that the effect of any realistic scenario for the coming years will therefore inevitably involve a less pronounced shift in the “centres of gravity”. 10According to this extreme hypothesis, Vienna replaces Prague in first place, followed closely by Bratislava (+0.2%) and Budapest (+2.8%). 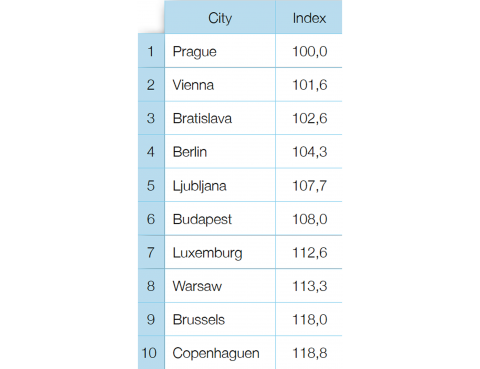 Prague moves down to fourth position (+3.1%), Luxembourg to twelfth (+22.7%) and Brussels to seventeenth (+30.6%), outmatched even by Rome and Sofia. Seen in this light, whether we consider only the present or – even more so – project into the future, it appears very difficult for Brussels to be an ecologically defensible capital of the European Union. Today, Prague, and perhaps Vienna in future, appear to have far more convincing advantages. 8 The coordinates of the demographic centres of all countries were calculated by Hamerly (2006). 12Within the framework of the EU-27 (Table 4), Luxembourg comes first among the capitals, followed by Brussels, Paris, Prague and Amsterdam. If, however, in addition to the capitals we include the other European cities with more than a million inhabitants or which are home to international institutions, Frankfurt and Strasbourg (+1.2 %) come before Luxembourg (+2.3%), whereas Cologne (+3.4%) and Munich (+5.3%) supplant Brussels (now in sixth place, +8.1%) and Paris (eighth, +12.2%). The choice of Brussels is less absurd according to this ranking than it is according to its ranking as the “diplomatic centre of gravity”. But it does not make Brussels the most ecologically defensible choice for today, and even less so for tomorrow. The index represents the sum of the distances between each city and the demographic centre of the countries weighted by the population of the countries. 13Not surprisingly, in the case of the maximalist enlargement scenario including, in particular, the large population of Turkey, the “demographic centre of gravity”, as defined, moves southeast (Table 5). 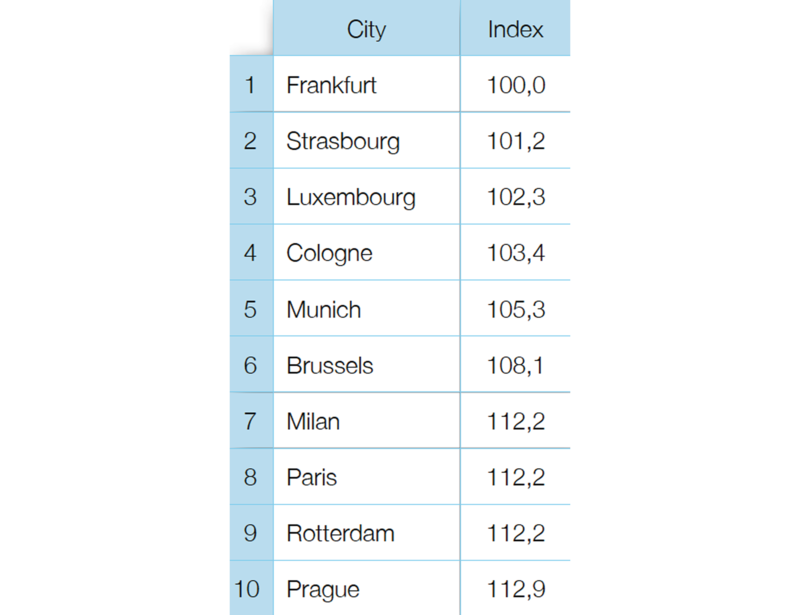 Munich therefore comes first before Frankfurt (+1.5 %) and Strasbourg (+2.5%), whereas Prague (+3.2%), Ljubljana (+4.5%) and Vienna (+4.6%) replace Luxembourg (seventh, +5.9%), Brussels (fifteenth city and ninth capital, +12.5%) and Paris (twentieth, +16.8%) as the top three capitals. 14The idea of a “demographic centre of gravity” is certainly more relevant than that of a “diplomatic centre of gravity” whilst evaluating the location of a potential capital from an ecological point of view. However, the people who are the most likely to participate actively in the activities of a European capital are not a representative sample of the European population as a whole, as they come from the big cities in the Union in disproportionate numbers. This leads us to a third approach aimed at determining the “metropolitan centre of gravity”. This time, this involves minimising the sum of the distances to all of the cities (capitals or not) considered in the previous approach by weighting these distances by a coefficient equal to the number of inhabitants (in millions) who live in the metropolitan areas of these cities. 15With respect to the EU-27, this change of indicator does not cause a major disruption in the rankings (Table 6). 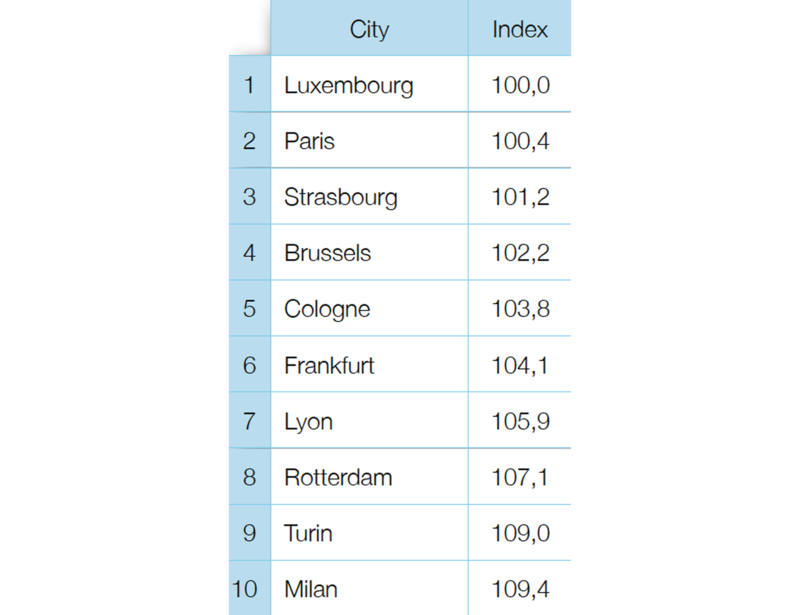 Luxembourg benefits nonetheless, coming first before Paris (+0.4%) and Strasbourg (+1.2%) – instead of Frankfurt followed by Strasbourg and Luxembourg – whilst Brussels moves up from sixth (+8.1%) to fourth place (+2.2%). 16The “maximalist scenario” of enlargement once again inevitably produces a shift towards the southeast (Table 7). However, despite the weight of Istanbul, the shift is much less significant with the “metropolitan” weighting of distances than it is with the “national” weighting used previously. This time, Strasbourg comes first before Luxembourg (+1.3%) and Frankfurt (+2.0%) – instead of Munich before Frankfurt and Strasbourg, whilst the top triad of capital cities is not affected by the enlargement: next to Luxembourg, Paris (eighth city, +5.2%) and Brussels (ninth city, +5.3%). Prague only ranks twelfth (+9.5%) and Vienna, fifteenth (+12.0%). 17In order to determine the most ecologically defensible location for the capital of Europe, the “metropolitan centre of gravity” is probably more relevant than its “demographic centre of gravity”. But perhaps we have not gone far enough. After all, those who are the most deeply involved in the activities of a European capital are of course not a random sample of the populations of the member states as a whole, or of the populations of their metropolitan areas as a whole. They are a disproportionate sample of people who are actively involved in governmental and nongovernmental organisations with an international dimension. These people are located at the heart of networks which have ramifications all over the territory, and are not distributed evenly throughout the territory, but are highly concentrated in a few privileged places where transnational citizenship is practised. 19Let us consider once again the current EU-27 (Table 8). 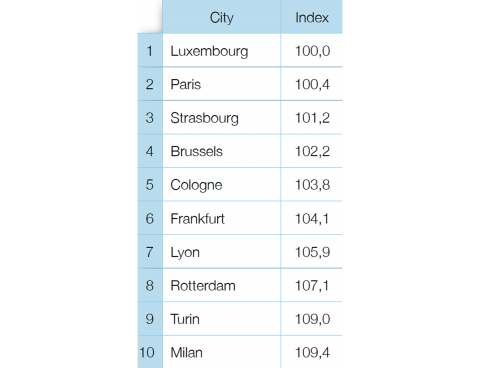 This time, Brussels ranks first, followed by Luxembourg (+8.8%) and Paris (+12.2%). 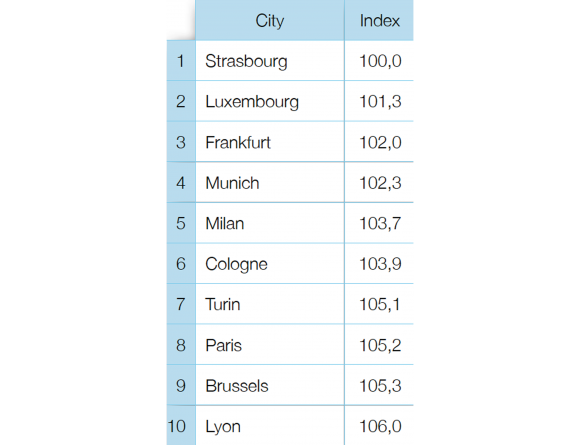 Strasbourg ranks seventh (+22.3%), Frankfurt eighth (+23.3%), Prague nineteenth (+74.8%) and Vienna twentysecond (+ 99.9%). The index represents the sum of the distances between each city and all of the other cities weighted by the number of representations of international governmental and nongovernmental organisations in the cities of origin. 20As there are not very many secretariats listed in the Yearbook which are located in the eastern periphery of the current European Union, even a maximalist scenario of enlargement towards the east would practically have no effect on the ranking (Table 9). 21What emerges from this sequence of simulations? First of all, if we adopt the “diplomatic” point of view, i.e. the minimisation of the sum of the distances to the member state capitals, the ecologically optimal location undergoes a significant shift towards the southeast considering the recent enlargements, and risks undergoing the same in future. But as soon as we recognise the limits of this interpretation of an ecological optimum, there is no reason to suppose that the successive enlargements which led to the EU-27, or even the most extreme perspectives of enlargement towards the east, lead or could lead to such a shift.10 If we consider the other criteria, the cities which feature at the top are not Prague, Vienna and Budapest, but rather, Luxembourg, Brussels and Paris, as well as Strasbourg and Frankfurt if the choice is not restricted to capitals. Even a maximalist scenario of enlargement towards the east will not change much. 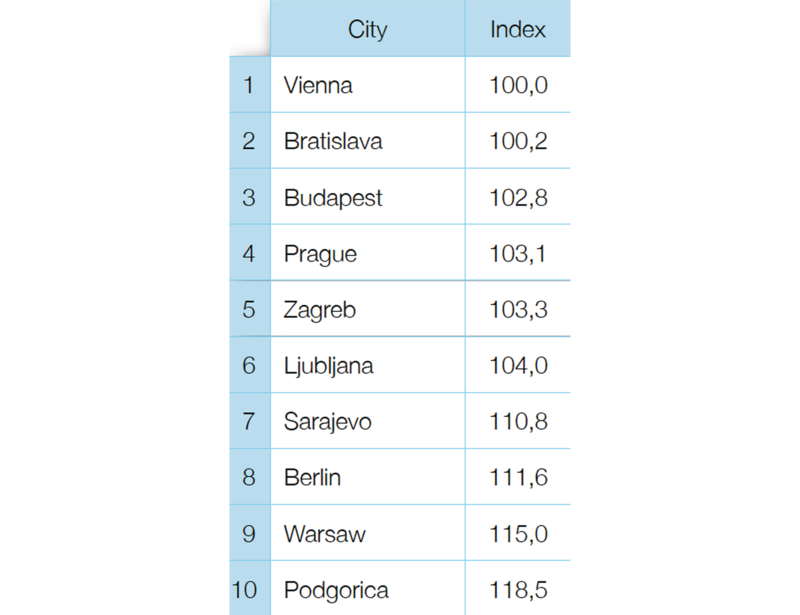 The ranking of these five cities therefore depends essentially on the relative importance attached to the different “centres of gravity” in the interpretation of what is ecologically optimal. 22Each of the four centres of gravity deserves a non-zero weighting. But in the short term, it seems legitimate to attach the utmost importance to the “civic” interpretation. Today, apart from the European civil servants, where are the people who are actively associated with the workings of the capital of Europe? Where do those who participate regularly in meetings of all sizes come from – those who are at the heart of the life of a political capital? However, compared with the others, the location of this “civic centre of gravity” is particularly contingent. Therefore, on the surface, the “civic centre of gravity” is the one which is most likely to undergo a shift. Setting aside the impact of possible enlargements summarised above, what could affect the location of the other centres of gravity? 23Not much, as regards the diplomatic centre of gravity. After the move from Bonn to Berlin, we cannot expect other changes of national capital in even the distant future. It is, however, possible that new capitals might appear: Edinburgh or Barcelona for example, or even Antwerp or Ajaccio. But all of this would be nothing with respect to the impact of the enlargements. The demographic centre of gravity as well as the metropolitan centre of gravity are likely to move. This could happen following major migratory movements, as was the case, for example, following the Wiedervereinigung from East Germany to West Germany or, following the enlargements, from Poland to the British Isles, or from Romania to Italy. Due to the combined effect of a low birth rate and a high level of emigration, a country such as Bulgaria lost close to 10% of its population in a decade. But here again, the movement is slow and the magnitude is relatively limited compared with the impact of a possible major enlargement towards the east. 24Splits, mass migrations and enlargements are rare, improbable and/or slow events. Though far from total, the stability of “diplomatic”, “demographic” and “metropolitan” centres of gravity seems nevertheless much more secure than that of the “civic” centre of gravity. Secretariats of organisations are created or moved much more rapidly and easily than capitals are added or moved, or than populations grow or shrink, are added or moved. 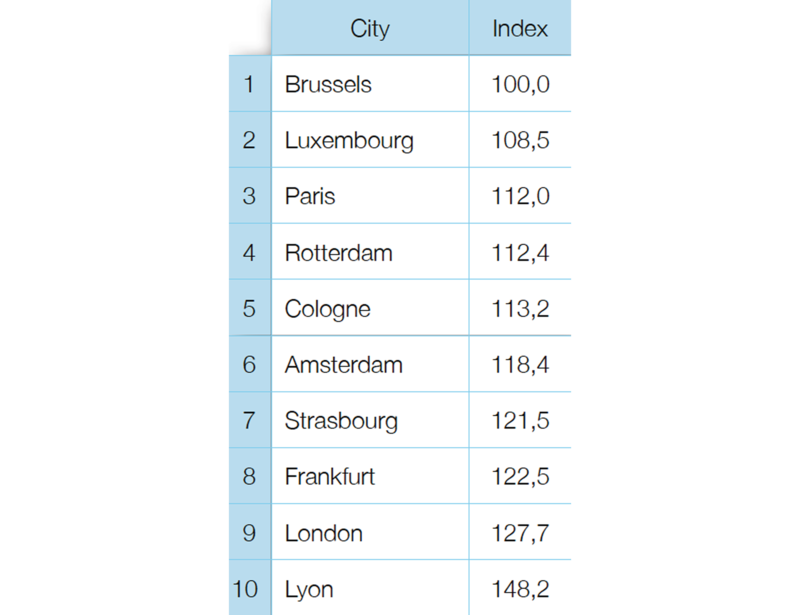 The clear advantage of Brussels above all other cities according to the “civic” criterion therefore seems much weaker than that of Prague, Frankfurt and Luxembourg according to the three other criteria. 25It is indeed the choice of Brussels – and to a lesser extent London and Paris – as the main headquarters of transnational organisations which is the source of this advantage. The reason why Brussels comes first according to this criterion is simply that, over the past half century, an ever growing number of plurinational organisations of all types have settled there. 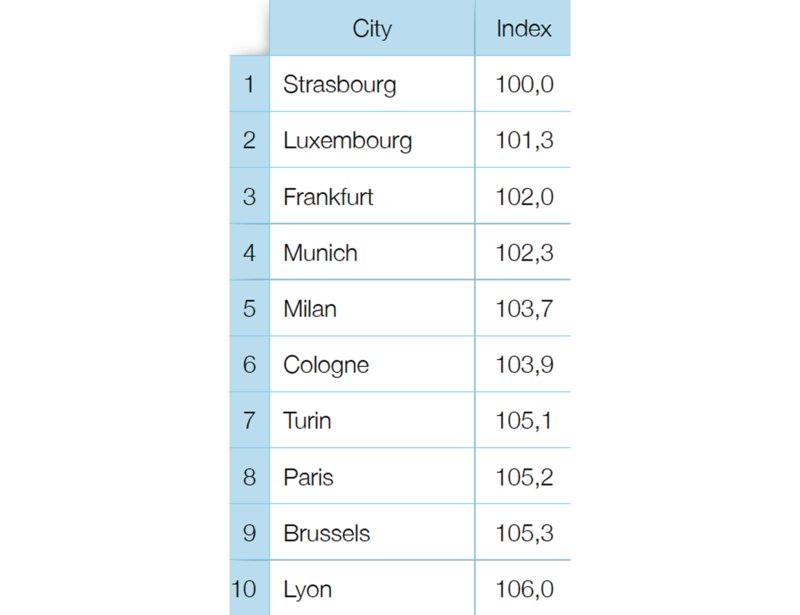 If they had chosen to settle in Luxembourg, Strasbourg, Prague or Vienna, the “civic centre of gravity” of Europe would not be Brussels today. And, very quickly, it would no longer be Brussels if they decided to leave and settle in one of these cities. Is there a chance that such a movement could take place? It cannot be ruled out entirely, but it would be extremely unlikely, bearing in mind three considerations. 26First there is the network power (Grewal 2008), which prevents the possibility of a gradual shift resulting from decentralised decisions. The reason for the growing number of pan-European or transnational organisations which decide to set up their headquarters in Brussels is also because it is important for them to be located near similar organisations which are already located there due to the proximity of the European institutions.11 The more organisations there are which have already made this choice, the more the “urban area externalities” will produce a magnet effect which will be very hard for an individual organisation to resist. If there is a shift, it could only happen top down, and not bottom up. Only a determined and deliberate move of the central European institutions, which have triggered the urban area effect due to their location and growth, could deactivate the forceful network power, which is closely linked to the very nature of any major political capital. 27Is such a decision to move conceivable? A second consideration – logically independent of the first – may lead us to have doubts, i.e. the stalemate which instantly characterised the European decisionmaking process regarding this particularly delicate issue. Even when the European Communities were only made up of six member states, they were never able to reach a formal agreement on the choice of a capital. It is due to a lack of agreement that the capital of the member state which had assumed the first rotating presidency gradually took root in the role as permanent headquarters of the main European political institutions. And if it proved impossible to reach a consensus on the choice of a capital when there were only six, nine or fifteen member states with a say and right of veto, how can we imagine doing so when there are twenty-seven member states? 28The probability of a collective decision to choose a capital other than Brussels is further reduced by a third consideration: the sunk costs, i.e. the irretrievable investments made in Brussels by the European Union institutions, the countless organisations located in Brussels due to its European function, and the families of tens of thousands of people who work for one or the other of these. This includes buildings which have been laboriously built or purchased over the years by the Commission, the Parliament and the Council, as well as the representations of states and regions, and the sumptuous or modest offices occupied by lobbyists, consultants and associations of all types. The Bavarian Parliament took years to approve the purchase and costly renovation of the former Pasteur Institute, so that its delegation could be located in an elegant building next to the European Parliament, and many less well endowed associations have gradually found offices which are not too expensive, with a fairly good location. Any vague desire to move the central institutions would therefore come up against enormous internal and external resistance. 29Indeed, if it became public, or even if it were seriously considered, the decision would not fail to trigger an explosion in real estate prices in the place of destination and a flattening of these prices in Brussels. The financial costs inflicted on institutions and organisations as well as their staff would therefore be phenomenal. Furthermore, the ecological costs – of constructions and commuting – during the long transitional phase between two locations, would inevitably reduce the strength of any long-term ecological argument in favour of a more central location in “diplomatic” or “demographic” terms. Admittedly, the American capital moved from Philadelphia to Washington DC, and the Brazilian capital from Rio to Brasilia DF. But this happened at times when big unoccupied spaces could be bought without encountering any opposition, and well before the political institutions attracted the presence of a civil society which exceeded them in size. Over the past two centuries, the demographic centre of gravity in the United States has shifted massively towards the west, but the federal capital has not given the slightest indication that it is willing to move an inch. 30Paradoxically, therefore, whilst it is much easier to move offices than it is to move capitals or populations, the civic centre of gravity is more stable than the diplomatic, demographic and metropolitan centres of gravity if we bear in mind these three considerations. Are there nevertheless conditions which might succeed in removing the padlock from the location of the EU capital, and in making it move despite the combined strength of the three mechanisms which keep it in place? Perhaps community rows which could degenerate into a civil war, or the implosion of the education system with consequences on criminality, or the development of an anti-European populism in the majority of the electorate? One may hope, however, that the Brussels, Belgian and European authorities would have the capacity to detect the nature and severity of problems in time and in everyone’s interest, as well as the intelligence to provide joint solutions. 31According to this hypothesis, whether or not there will ever be an end to the double location of the routine activities of the European Parliament, Brussels will continue to strengthen its position as the “civic centre of gravity” of the European Union. This is not enough to guarantee that it is the optimal capital of the European Union from an ecological point of view. In order to determine the optimal choice, even within the strict framework of our project, it would be necessary to assign a specific weighting to the four “centre of gravity” criteria, which we have not done. But due to the lasting advantage it has established for itself as the civic centre of gravity, combined with its proximity to the demographic and metropolitan centres of gravity, there is no doubt that as regards its location, Brussels constitutes an ecologically defensible capital of the European Union. The fact that this advantage is historically contingent and path-dependent does not make it unstable for all that. 32This assurance cannot, however, be interpreted as an invitation to complacency and passivity. It must, on the contrary, motivate the inhabitants of Brussels and Europeans alike to make their city and their capital a better place to live in, and a better capital for all of the citizens of the unprecedented political entity of which Brussels is the heart. CARMEL Philip, (2005), “Battling for Europe’s Jews (Part 2). In capital of European Union, Chabad wields great influence”, Jewish Telegraphic Agency Website (JTA), April 20, 2005. CROISÉ-SCHIRTZ Edmée, (1996), “La bataille des sièges (1950‑1958)”, in Le Luxembourg face à la construction européenne, Luxembourg: Centre d’études et de recherches européennes Robert Schuman, pp. 67‑104. DEMEY Thierry, (1991), Bruxelles. Histoire d’une capitale en chantier. Vol. 2: De l’Expo 58 au siège de la C.E.E., Brussels, Legrain. DEMEY Thierry, (2007), Bruxelles, capitale de l’Europe, Brussels, Badeaux. GREWAL David Singh, (2008), Network Power. The Social Dynamics of Globalization, New Haven, Yale University Press. HAMERLY Greg, (2006), Population-weighted European state centers, Baylor University, Computer Science Department. HEIN Carola, (2004), The Capital of Europe. Architecture and Urban Planningfor the European Union, Westport (CT), Praeger. HEIN Carola, (2006a), The Polycentric and opportunisitc capital of Europe, in Brussels Studies No.°2, December 2006, 8 p.
HEIN Carola, (2006b), “Brussels and the Capital of Europe”, Bruxelles l’Européenne, Cahiers de la Cambre Architecture 5, pp. 18‑50. HEIN Carola, (2006c), “European Spatial Development, the Polycentric EU Capital, and Eastern Enlargement”, Comparative European Politics 4 (2/3). LETHÉE Mathieu, (2003), L’Europe à Bruxelles dans les années 1960, mémoire de licence en histoire, Université catholique de Louvain, 2003. MONNET Jean, (1976), Mémoires, Paris, Fayard. SARACENO Elena ed. Brussels Capital of Europe. Brussels: European Commission, October 2001, 140 p.
Union of International Associations, (2008), Yearbook of International Organizations 2008‑2009 – Vol. 5: Statistics, Visualizations and Patterns, 13th edition, München, KG Saur Verlag. pi, the weighting of point i. The points of destination are cities, and the points of origin are cities or demographic centres of countries (as calculated by Hamerly 2006). The distances used are great circle distances, i.e. the shortest distances between two points on the surface of the earth, measured along the surface of the sphere. by the number of secretariats of international governmental and non-governmental organisations for the civic centre of gravity. City coordinates: Wolfram|Alpha curated data (2010), www.wolframalpha.com (consultation in January 2010). Demographic centres of the countries: Hamerly (2006), based on data from the Socioeconomic Data and Applications Center (Columbia University) and the geographic coordinates of the administrative bodies of European countries. Populations of countries: Wolfram|Alpha curated data (2010), www.wolframalpha.com (retrieved in January 2010). Population of metropolitan areas: National Institute of Statistics and Economic Studies (2007), Urban areas in the European Union with more than 1 million inhabitants, France. Number of main and regional secretariats of international governmental and non-governmental organisations: Union of International Associations (2008). 2 Signed in Rome in March 1957, the Rome Treaty entered into force on 1 January 1958. During an emergency meeting held in Paris on 6 January 1958, it became patently obvious that the six member states of the communities established by the treaty, unanimous in their desire to have a single headquarters for all of the European institutions, would not reach an agreement on the choice of city in which they would be located. The first presidency of the Council of Ministers of the European Economic Community was chosen by alphabetical order and was entrusted to Belgium, which was therefore also responsible for providing housing to its first civil servants. The Belgian government set its heart on an office building which the Royale Belge insurance company (today Axa) was building along the Cinquantenaire Park. See Demey 1991: 175‑181 and 2007: 187‑194, Lethée 2003. The rest was due to the irrepressible need for new offices, combined with persistent indecisiveness. 4 A differentiated weighting of distances by the presumed volume of pollution associated with the means of transportation used would have the likely short- and longterm effect of increasing the relative advantage of cities located in the densely populated and highly interconnected area of northwest Europe. 5 See Hein (2004, 2006a, 2006b, 2006c). On the other hand, it makes the permanent comings and goings of the European Parliament difficult to endure due to the double location of its routine activities. See the petition www.oneseat.eu which gathered one million signatures in September 2006 on the initiative of Swedish Euro MP (now commissioner) Cecilia Malmström, and was echoed in countless economic, democratic and ecological pleas in favour of a single headquarters for the European Parliament. 6 All the same, this is not the reason why it was chosen. It was chosen because the Belgian government – a homogeneous Social Christian cabinet directed by Liege politician, Pholien – insisted on proposing Liege, whilst the five other member states were ready to join together in Brussels. See Monnet (1976: 433), Croisé-Schirtz (1996). 7 If we had added other big cities to the 27 capitals (as we shall do for the other “centres of gravity”), Prague and Vienna would have remained at the top, but Frankfurt would have ranked third. We may, however, assume that the use of member state capitals only was necessary in the case of the “diplomatic centre of gravity”. 9 In order to differentiate the significance of establishments, the main secretariat of an organisation was weighted three times more than a national or regional secretariat, as listed in the Yearbook of International Organisations (details in annexe 2). 10 This conclusion would be further reinforced if our notion of ecologically defensible location had taken into account the most likely means of travel. We can assume, for example, that there is a greater chance that people will travel by train between Paris and London than between London and Vienna, whereas the likelihood to travel by air from Athens or Istanbul to Paris or Prague must be about the same. 11 An example among countless others: in 2000, the traditionalist Jewish movement Chabad-Lubavitch created a European coordination organ, located in Rue Froissart in Brussels. Its website states that, “as befits the Rabbinical Centre of Europe, its offices are situated at the centre of the European Union”. In 2004, Ricardo Levi, director of the Group of Policy Advisers for Romano Prodi, president of the European Commission, was questioned by more oecumenical Jewish organisations such as the Conference of European Rabbis, and suggested that they “open a Brussels office in order to counteract the Rabbinical Centre’s influence among European legislators and officials”. (Carmel 2005). The European Rabbis Conference does not seem to have followed this recommendation yet, unlike the European Jewish Congress which opened an office in Brussels in October 2009 (http://www.ism-france.org/news/article.php?id=12903&type=communique). Philippe Van Parijs has a doctorate in philosophy (Oxford) and in social science (Louvain). He is responsible for the Chaire Hoover d’éthique économique et sociale (Louvain) and is visiting professor at Harvard and Leuven. He is the author, among others, of Linguistic Justice for Europe and for the World (Oxford University Press, forthcoming). After studying economics at Facultés universitaires Saint Louis and UCL, as well as working at the Centre de recherche en économie at FUSL and the “Global Location Strategies” division at IBM Consulting, Jonathan Van Parys joined the operations research department at the SAS Institute. He is currently on leave from his position in operations research at SAS Institute.